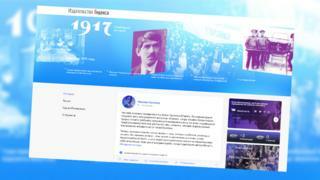 A new Russian internet project is reliving the events leading up to the Bolshevik Revolution of 1917 as if the historical figures of the time were posting on social media. The project, called 1917: Free History, aims to recreate the world of the people whose lives were transformed and, in some cases, shattered by the impending revolution. Their stories are told through a mixture of Facebook-style real-time updates, historical live pages and interactive features. Users following Tsar Nicholas II's updates will see him marking his 22nd wedding anniversary with the Tsarina and their children, then travelling a few days later to a military headquarters as a crisis brews for the Russian army. Other posts show the Tsarina's infamous confidante, Rasputin, telling her that "God has not forgotten Russia", while exiled Bolshevik leader Vladimir Lenin is in Zurich musing on the Communist Manifesto and the role of the proletariat in the nation state. "We have imagined how things would have been at that time if there was an internet and people were using social media," chief editor Mikhail Zygar told the The Village website last month. Mr Zygar, previously chief editor of liberal TV station Dozhd, said a team of more than 100 historians, journalists and web professionals worked for more than a year to source letters, diaries and other materials from historical archives. The website emphasises that its content is authentic, though in some cases it has been abbreviated to suit the format. Each historical figure has a list of "friends" much like on modern day social networks. Aside from the main political figures and their families, the project features a wide cast of characters including artists, writers and opera singers. The project is due to run until January 2018. In the Soviet Union, the 1917 Revolution was celebrated as the key event in the nation's history. These days it is no longer officially marked, but few doubt its historical importance. As Mr Zygar told The Village: "It seems to be that everything that happened to us in the 20th century and is happening now is a consequence of the events of 1917."